Mia Angel Two Seater Salon Sofa elegant and comfortable with upholstered seat and side panels available in a range of colours, please note that some colours may incur an extra charge. 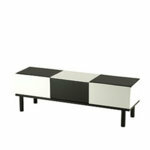 The Wooden frame is available in either white gloss or black gloss laminate finish. please use the drop down boxes to choose your colour options. 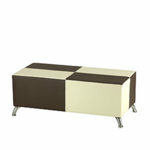 Dimensions: Width 145cm, Height 80cm, Seat Height 50cm, Depth 78cm. 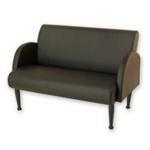 Direct Salon Supplies SK Worcester 3 Seater Reception Bench, available in a wide range of fabrics in all one colour(please use the drop down box to choose your colour) also two colour mix available at no extra charge, please ring 01270 630280 after ordering to tell us your two colour choice. Direct Salon Supplies SK Windsor 2 Seater Reception Bench, available in a wide range of fabrics in all one colour(please use the drop down box to choose your colour) also two colour mix available at no extra charge, please ring 01270 630280 after ordering to tell us your two colour choice. Direct Salon Supplies SK Oxford 3 Seater Reception Bench, available in a wide range of fabrics in all one colour(please use the drop down box to choose your colour) also two colour mix available at no extra charge, please ring 01270 630280 after ordering to tell us your two colour choice. Mia Prince comfortable two seater salon sofa with a lacquered wooden frame and upholstered seat and back rest, please use the drop down boxes to select your colour options. REM Rubic Coffee Table. 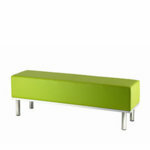 Available in any of laminates from the REM range (please use the drop down box to select). Sizes: Width 45cm, Height 30cm, Depth 45cm. consisting of two straight and two corner waiting seats offering comfort, versatility and style, these Buckingham seats can be supplied in a single colour or two tone colour and available in any colour from the REM range of fabrics(please use the drop down boxes to choose your colour or colours). Rem Buckingham Waiting Straight Seat, great waiting seat which offers comfort, versatility and style. The Buckingham is suitable for any salon in ones or twos for small salons in in rows of any number for the larger salon, with straight and corner seats available making it more than adaptable for all reception areas. The Buckingham waiting seats can be supplied in a single colour or two tone colours, they are available in any fabric from the REM range (please use the drop down boxes to select your colour or colours). Sizes: width 48cm, height 107cm, depth 65cm. 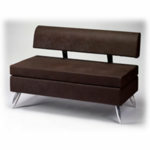 Rem Buckingham Corner Waiting Seat, again offering comfort, versatility with style. The Buckingham is suitable for any salon be it large or small, with straight and corner seats available making it adaptable for all reception areas. These waiting seats can be supplied in a single colour or two tone colours, they are available in any fabric from the REM range (please use the drop down boxes to select). Please Note Leopard And Zebra fabric extra charge. 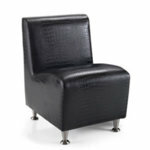 Direct Salon Supplies Anna 2 or 3 Seat Waiting Settee is the ideal piece of furniture to make a stylish entrance to any salon. Please use the drop down box to choose). 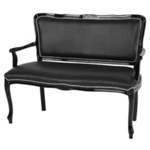 Dimensions: 2 seater height 65cm chair back and 41cm chair seat, width 122cm, depth 60cm. 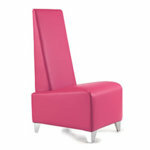 Sizes: 3 seater height 65cm chair back and 41cm chair seat, width 169cm, depth 60cm. May take up to 4 weeks for delivery for other colours please ring for further information. 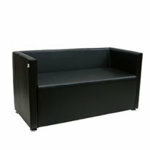 Anna 2 seater and 3 seater in Black in stock. 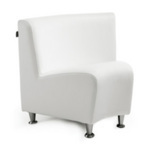 Direct Salon Supplies Anna Waiting Seat is the ideal piece of furniture to make a stylish entrance to any salon. 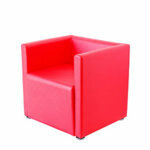 Dimensions: height 65cm chair back, 41cm chair seat, width 66cm, Depth 60cm. Available in a range of colours. May take up to 8 weeks for delivery. Please ring for further information. black, chocolate, white, lime green, red, blue, orange (Please use the drop down box to choose your colour). Please note may take up to 8 weeks for delivery. Please ring for further information. Sizes: Height 78cm, Width 117cm, Depth 70cm. Direct Salon Supplies Milano 2 Seater Waiting Seat in a choice of colours black, chocolate, white, lime green, red, blue, orange (Please use the drop down box to choose your colour). Please note may take up to 8 weeks for delivery. Please ring for further information. Sizes: Height 80cm, Width 120cm, Depth 65cm. 1 Left In Stock In Silver. Rem Opal Vanity Unit, a stylish beauty unit from Rem with the central part of the unit featuring a stainless steel basin and worktop with a single cold and hot water, chrome tap. Two doors with stainless steel handles open to reveal a height positional internal cupboard shelf. 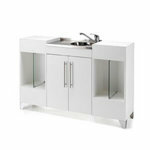 The Opal Vanity Unit is available in any colour from the REM range. Please use the drop down box below to choose your laminate colour. Dimensions width 140cm, height 96cm, depth 36cm. REM Elegance 4 Seater Waiting Corner Seating Set can be used in any combinations, consisting of 2 straight seats and 2 corner seats. The elegance chairs available in any colour or two tone colours from the REM range, elegance chairs shown in Bison and White. REM Elegance Waiting Seat complete with Rubic coffee table. Available in a large choice of different coloured fabrics and laminates from the REM range. 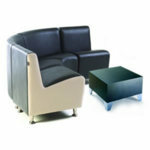 Includes 2 Elegance waiting chairs, 2 Elegance corner waiting chairs and Rubic coffee table. Elegance seats can be supplied in a single colour or two tone colour and available in any colour from the REM range of fabrics(please use the drop down boxes to choose your colour or colours). please ring 01270 630280 for more details. REM Elegance Straight Waiting Seat. Available in any colour or colours from the REM range of fabrics. Elegance seats can be supplied in ones, twos, threes or fours and are available in single colour or two tone colour, you can choose from any colour or colours from the REM range of fabrics(please use the drop down boxes to choose your colour or colours). Sizes: Width 50cm, Height 74cm, Depth 64cm. REM Elegance Corner Waiting Seat. Available in any colour or colours from the REM range of fabrics. Elegance seats can be supplied in ones, twos, threes or fours and are available in single colour or two tone colour, you can choose from any colour or colours from the REM range of fabrics(please use the drop down boxes to choose your colour or colours). REM Showcase 3 Retail Display. 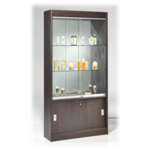 The Showcase 3 with wooden doors below with optional lockable glass door for above as an option. Sizes: Width 94cm, Height 193cm, Depth 30cm. Available in a choice of laminates from the REM laminate range, shown here in Bonobo (Please use the drop down box to choose your laminate). Nelson Mobilier Isle Waiting Seat. A stylish modern waiting seat available in any fabric from the Nelson Mobilier range (Please use the drop down box to choose). 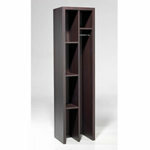 Sizes: Depth 820mm, Height 860mm, Length 2010mm. Nelson Mobilier Krypton Double Waiting Seat. A comfy stylish waiting seat available in single main colour or two colour main and a edging colour (Please use the drop down box to choose). Sizes: Depth 620mm, Height 830mm, Length 1300mm. the Beauty Store features four height positional shelves and a chrome finished hanging rail with the capacity to hold five garment hangers. The Beauty Store is available in any colour from the REM laminate range(please choose your colour from the drop box below). Sizes width 45cm, height 193cm, depth 40cm.